The MOBI technologies 70001 MobiCam Wireless System is a simple, reliable, and highly economical solution for any basic remote monitoring needs. Requiring no installation, the 70001 MobiCam system’s compact design and wireless technology allow you to position the camera and monitor virtually anywhere making it both easy to use and completely portable. 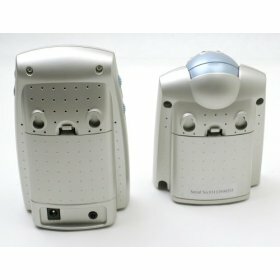 The 70001’s camera features automatic voice-activated video transmission with an adjustable sensitivity, as well as IR (InfraRed) LEDs (light emitting diodes) that allow you to receive a picture in total darkness, making it an ideal solution as a baby monitor or for other in-home surveillance. 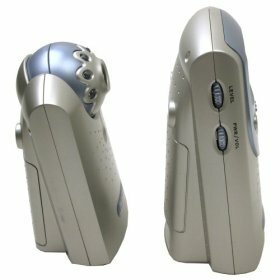 The 70001 MobiCam’s camera utilizes the NTSC signal system to achieve 510 by 492 effective pixels of resolution. The IR LED emitters allow this camera to receive a picture under no-light (0 Lux) conditions up to 10-feet away, while the built-in microphone allows for one-way audio transmission and enables the voice-activated video transmission feature. The MobiCam’s camera includes a built-in 2.4 GHz omni-directional antenna and three selectable channels that allow you to use multiple cameras with a single monitor. This unit’s compact design allows it to be placed in tight spaces such as cribs or shelves, while its adjustable ball-mount-style camera lens lets you achieve an optimum viewing angle. 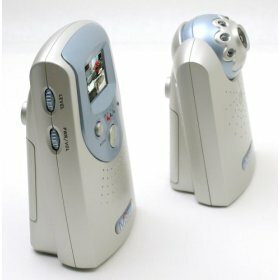 The MOBI 70001 camera can run on either nine-volts DC power via an included AC/DC adapter or eight AA batteries for additional portability, and has an operating temperature of 0 to 40 degrees Celsius.? The 70001 MobiCam’s 2.4 GHz monitor allows for signal reception from up to 300-feet away with a clear line of sight. This unit utilizes a 1.5-inch TFT (Thin Film Transistor, or active-matrix) LCD (liquid crystal display) screen that provides you with a clear and sharp picture with 490 by 240 effective pixels. The MOBI 70001 monitor includes three selectable channels to allow you to monitor multiple rooms, and a standard A/V (audio/video) output jack for connecting to a TV or VCR. The 70001’s monitor runs on batteries or via an included AC/DC adapter, while optional PC software and an adapter allows for automated recording via the Internet, your cell phone or pager. 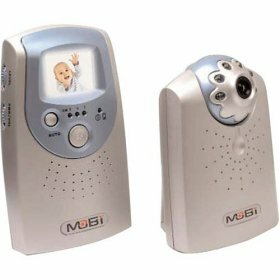 Designed primarily for indoor use, the MOBI 70001 MobiCam system deserves serious consideration as one of the easiest and most portable economical monitoring solutions available, especially for parents traveling with a small child. While both camera and monitor are freestanding units, mounts are included for each allowing additional installation options. This system is made in the USA and was the winner of the 2004 iParenting Media Award. Users should note that the camera’s image sensor may become permanently damaged if exposed to long hours of direct sunlight or halogen light, so the camera should not be mounted or pointed directly at the sun or other bright-light sources. Lux rating is the measurement used to indicate how sensitive a camera is to light, and stands for the level of light reflected off a piece of paper by a candle from one meter away. Thus a sensitivity of three Lux would mean a camera could generate an acceptable picture of a piece-of-paper-sized object that was illuminated by the equivalent of three candles from one meter away. The lower the Lux level, the better the camera’s ability to work in low-light conditions. The camera’s resolution should be greater than or equal to the resolution supported by the system’s recorder or monitor. The S/N, or signal to noise ratio, is an important measure of a camera’s quality. A poor camera, low-light conditions or poor wiring causes “noise” which consumes processing power and disk space. A camera with a wide dynamic range is ideal, especially for recording areas in which both indoor and outdoor light are present. CCD (charge-coupled device) sensors provide high-quality images that are less susceptible to noise. CMOS (complimentary metal-oxide semiconductor) sensors offer less image quality, but are usually more cost-effective and energy efficient. What’s in the Box : Camera, monitor, mounting kit, A/V cable, and AC adapter.